OpinionPLUS is a simple and straight forward survey site. 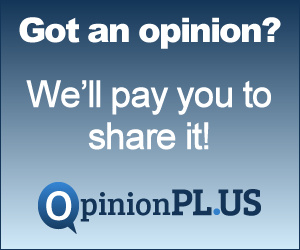 Most surveys at OpinionPLUS will take around 10-15 minutes. Your earnings at OpinionPLUS are paid automatically to you in the following month, as long as you have meet the minimum threshold of 1000 points = $10. Payment is via PayPal. If you are looking for a simple and easy to use survey site OpinionPLUS is for you.